Best Deals of the Week at Target 3/18 – 3/24 New $5/2 Revlon Printable Target Coupon = Freebies! 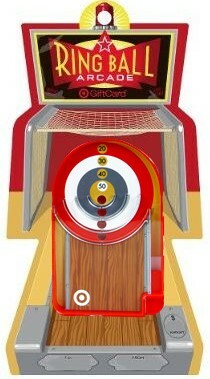 This week’s Ring Ball Arcade Gift Card is very entertaining as it is a mini arcade game! The object is to pull the lever and try to shoot the ball into the bullseye, with the most points being scored if the ball goes thru the center hole. It’s compact so it will fit in a pocket or purse – perfect for taking along on shopping trips to help keep little ones entertained. And of course the winner will be entertained spending the gift card, as it will come pre-loaded with $50 on it to buy whatever they wish! I already “like” you on Facebook, naturally. Your site is awesome! Please enter me in this contest! I also like you on Facebook (asia sassypants), thanks! Fun, fun, fun gift card. Thanks so much for this giveaway! Totally Target is Totally Cool For these give aways! Liked ya on fb too!! I’d be so excited to win! Love the blog. Hope I win! Can’t wait! …which is too short of a comment, lol! Of course I “like” Tot Targ.! Thanks for all the time you spent finding this deals. Just Like Totally Target, So happy i found you. Target is my favorite place to shop!!! I love your blog, it is very helpful to a beginner like myself. I just Liked you on FB as well! Thanks! This would amazing!! I love it!! I “like” Totally Target on Facebook! Hope to win this time. Thanks for this giveaway. I hope I get lucky! You rock! Thanks for the giveaway! Already like u on facebook! I already like you on facebook. Thanks for all you do! Thanks for the great offer. Target is far better than Walmart!! Thank you for this awesome chance! Already like TT on FB! Thank you!